SAN FRANCISCO, April 13 (Xinhua) -- Large-scale high-tech corporations on the U.S. West Coast have been eyeing central and east states to open new headquarters and branches, which experts believe is essential for fulfilling their quest for growth and talent. 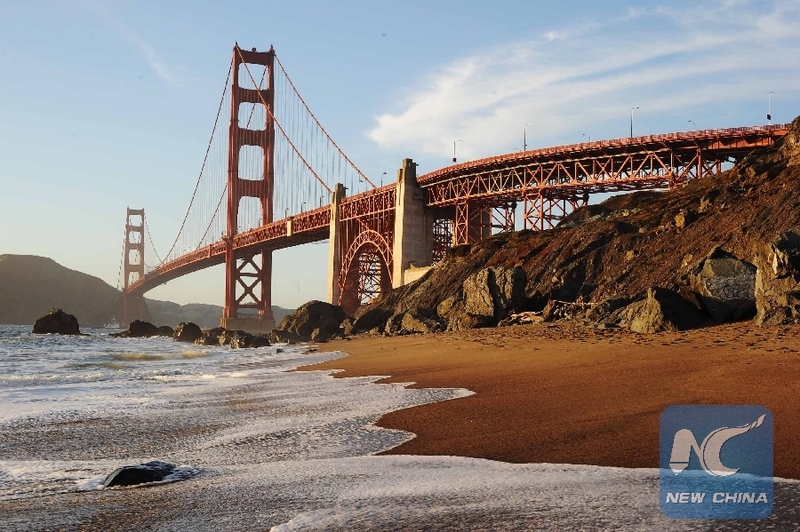 "Talent, money and market," Del Christensen, Chief of Global Business Development for the Bay Area Council (BAC), told Xinhua while explaining the phenomenon dubbed "eastward expansion" by U.S. media. Among the first group to move eastward, Seattle-based e-commerce multinational Amazon had sought to open a second headquarters in the country. BAC, which represents San Francisco Bay Area and Silicon Valley in public affairs and strategy management, took part in the bidding on behalf of the Bay Area. Amazon decided to split its new headquarters between Long Island City in New York City and Crystal City in Arlington, Virginia, but had to give up the plan for Long Island City citing political and social-economic hurdles. Meanwhile, Silicon Valley giant Google is expanding its NYC office by doubling the number of staff, while Apple has announced plans to build a second campus in Austin, Texas. With an investment of about 1 billion U.S. dollars, Apple's expansion will hopefully bring the city 15,000 jobs. Its first campus in Austin has already grown almost as big as the 5-billion-U.S.-dollar Apple Park in Cupertino, California. "I think the biggest one (reason), the most important one, is a quest for human capital, right?" said James DeNicco, Director of the Principles of Economics Program at Rice University. Going for talent is the No. 1 consideration for Seattle and Bay Area's high-tech giants. They map out Austin, because top schools like University of Texas can be relied upon for sustainable high-level human resource, and an aggregation of medical centers and hospitals here and in the neighboring city of Houston will serve their employees' health to the best degree, DeNicco told Xinhua. "They want to go where the young talents are, where young people want to live, and they just want to live in these cities (that these corporations target)," said DeNicco, referring to Texas' high-quality workforce and unmatched economic environment. Since late 1980s, the aggregation of tech companies in Austin has brought the city a new nickname "Silicon Hills." The hilly city, with its growing academic and high-tech sectors, has since lived up to expectations. Other big names in technology industry including Uber, Facebook and LinkedIn have also embarked on eastward expansions - driven by a common goal -- hunting for talent. Their choices of location still favor New York, Washington D.C., Boston and other already developed eastern cities. To gain more opportunities in high-tech giants' east expeditions, cities like Pittsburgh are also flexing their muscles in technology. In addition to a globally top-ranking computer science program, one of the city's top universities Carnegie Mellon now boasts a new program of artificial intelligence research and development. Google has been growing really fast in recent years, and is "buying up land like crazy, and so is Facebook," said Jim Wunderman, BAC's President and CEO. "The tech industry is really the command industry globally," Wunderman said. Silicon Valley, where Google and Facebook were born and have been growing a lot, can't accommodate all their growth. So they have to find some other places, Wunderman told Xinhua. "You're going to have to go to other parts of the country and other parts of the world. That's what they're doing, and I think they'll keep doing that." "The Bay Area can only support so many people. The housing is already ridiculously expensive. Silicon Valley in the Bay Area will always have a special place in that world, and that's what makes it so expensive to live here," he said. San Francisco, San Jose, Oakland and Seattle, bearing the blunt of the impact of those giants' growth, are the four most expensive major cities in America based on home values, according to The New York Times. The Washington Post this week reported that Amazon's "explosive growth" has made it "Seattle's largest private employer and taxpayer in less than a decade," offering 45,000 jobs in a city of 725,000 people. DeNicco took innovation and business-friendly environment as other factors contributing to the eastward expansion. "Innovation is key for all companies, but especially for those tech companies. They need that innovation to stay on top," he said, adding that hiring younger talents is one way to innovate. Another consideration is political capital, which is conventionally concentrated on the U.S. East Coast, including Washington D.C. and Boston. "They might be able to get the ear of the policy makers. If you get the ear of the policy makers, you can help make it more business friendly for you. They want collaborative relationships with policy makers as well," said DeNicco. "Move to grow" - this has become the mainstream decision among the large corporations on the West Coast. "If you don't change and adapt, you get left behind. This is why and how it happens," added DeNicco.